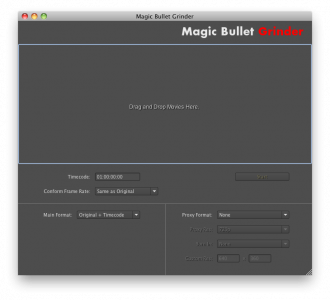 » Review – Magic Bullet Grinder you down with FCP? I woke up this morning to an email from the fine folks at Magic Bullet. It had all kinds of info about their new helper app “Grinder” It is a new app designed to help batch convert your output from a canon 7d/ 5d/ 1d / t2i…. etc. It will convert the h.264 native files into prores or photo-jpeg. It also can help speed up creating lower res proxies, AND adding timecode! I decided to grab the demo and give it a spin! Here is what I found. The main window is simple, drag and drop your original .MOV files in. Select a starting timecode, main format, and proxy format (if applicable) and hit start. Select an output directory and hit OK. It was very quick on my 8 core Mac Pro, cranking through 5 clips in less than a minute (that was only adding timecode to the h.264, not converting). It gives you a text log in the output directory noting any errors and processing times. I opened up both the original and the converted file in quicktime and noted the addition of timecode data. And then was quickly disappointed. While having some timecode is better than none, this implementation strikes me as odd. It gives the same starting timecode to the beginning of every clip. I really expected the app to somehow look at the “date modified / created” info from the metadata and generate a timecode from that. It might not be dead-on accurate compared to actually having free-run timecode, but it would be a great step in the right direction. At least that way we could sort clips chronologically and not by name. I may be missing something, but unless you choose to manually add timecode specifically to each clip, then using the frame number would be just as useful as each clip having the same timecodes. In the image above, the files ending in” -Original” are Grinder’s weird way of saying that they are the converted files in the original format with time code. You can see the starting timecode is at 1 hour for the clips with time code. Other than that one disappointment this seems like a useful app, albeit not necessarily a needed one. It doesn’t have anything (other than that strange timecode implementation) that can’t be duplicated with the canon plug-in, but I doubt that is the point. This way a loader could have a $50 piece of software as opposed to a $1,000 one. I suppose Mpeg streamclip is not user-friendly enough for some people, and that would justify the $40 price tag fairly easily. 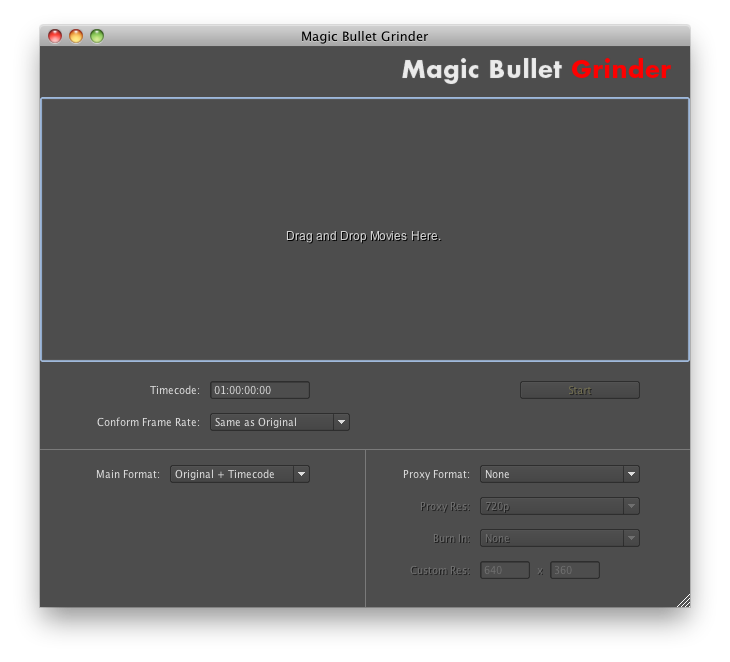 I hate to be a downer, and I really think that Magic Bullet does some amazing stuff. Maybe my hopes were too high on this one. I look forward to their next release, and maybe even the next update of this app. On the other hand, I also am really glad I didn’t drop $50 on this. Would have been helpful if you ran proxy tests. Don’t think MPEG streamclip is set up as a proxy generator, and the only existing option that I know if is Proxymill, which is way too expensive.